I'm got a custom built PC running 64 bit Windows 7 Ultimate. So far everything works great except for one thing: it will not wake up from sleep mode for a wake timer or scheduled task. Sleep mode itself works great. If it's sleeping, it wakes successfully when I press the power button, mash the keyboard, wiggle the mouse, or send a WOL packet. The only problem is wake timers. I even tried the program WakeupOnStandBy but it looks like that uses wake timers, so it doesn't do anything for me either. Any ideas on how to fix the problem, or troubleshoot it? I'd imagine that there would be a log somewhere telling me exactly why the wake timers are having trouble, but if there is I haven't found it. I've struggled with this problem before, and have only been able to do it on one of my PCs. Does your PC have a wake timer feature in the BIOS? If not, it may not be capable of waking up to a schedule. Try changing the Bios sleep modes, i.e. S1, S2 etc. Sorry I can't give you a definitive solution. I too would advise checking the BIOS like Roh suggested. More specifically, check the power-management options and report the settings, particularly the one that selects whether to use S1 or S3 for standby. You can also use Microsoft’s power utility to get a dump of Windows’ power-management settings. Change advanced power settings). -> “Sleep” option, “Allow wake timers.” ->"Enable"
I had the same issue and fixed this way. I'm pretty sure you will need to enable the wake timer in the BIOS. It doesn't matter what time you set it to, there just has to be a value. That makes the wake-timer enabled and the OS can update it with whatever it wants. It's a slightly wierd UI, but that's what the BIOS writers seem to have standardised on. Not the answer you're looking for? Browse other questions tagged windows-7 windows 64-bit sleep wake-up or ask your own question. Can a Windows PC do anything while it is sleeping? Can I make my PC backup and then sleep on demand with WHS? 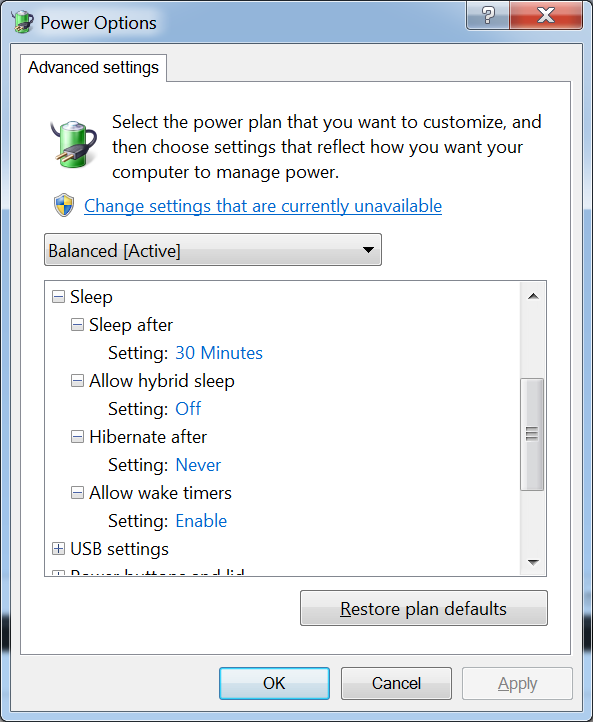 Is there a realiable way to troubleshoot wake up from sleep in Windows? Why is Windows 8 waking up the PC even when there are no wake timers and no pending maintenance tasks?